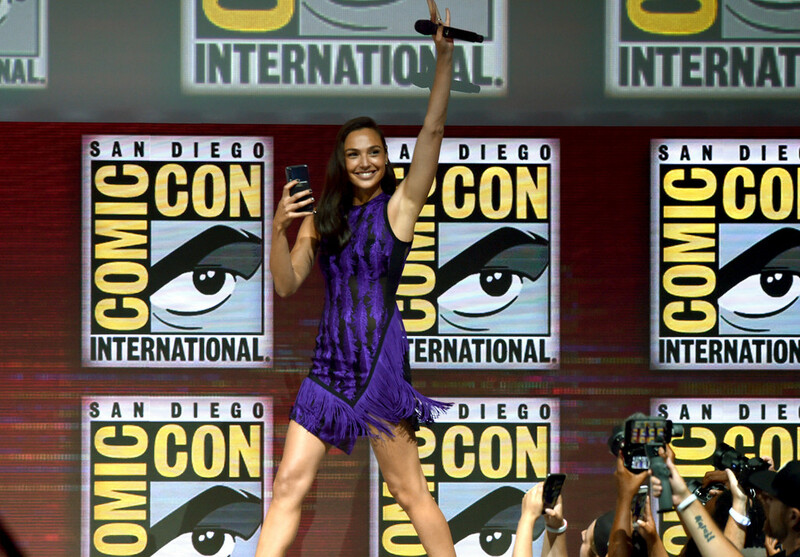 After a whirlwind weekend culminating in a struggle of flight issues, I am back and ready to give you my top favorite moments from Comic-Con 2018! Let’s dive in, shall we? This panel was hilarious, fresh, and fun. My first time checking it out, this Lynette Rice-moderated discussion featuring today’s male TV heroes included Benedict Wong (Deadly Class), Dylan Bruce (Midnight, Texas), Santiago Cabrera (Salvation), Tom Ellis (Lucifer) Jay Hernandez (Magnum P.I. ), Eoin Macken (Nightflyers), and surprise guest Stephen Moyer (The Gifted). During this richly hilarious and divine panel, our heroes discussed topics that covered the thrill of playing iconic characters, the sometimes-awkward fan encounters, and the ups and downs of careers in Hollywood. There were detailed stories of fake IDs, bad blonde dye jobs, secret crushes, and more reveals from Eion Macken’s childhood. Santiago said he uses his star power daily to get food at craft services first, and Dylan has always had a thing for Michael J. Fox: “I used to dress up like him Family Ties and carry a briefcase and all!” There were more laughs than I could count, and this panel is definitely not to be missed next year! I got so much scoop that I had to write another article, so check it out! But basically, Riverdale is the best. I’m already excited about season three, and I demand a crossover with the Chilling Adventures of Sabrina — somehow and some way — when it premieres. I had the BEST Comic-Con family reunion. And I say family reunion because in my mind, we are just that. I have loved every moment of Black Lightning and any time I get a chance to support, I do! 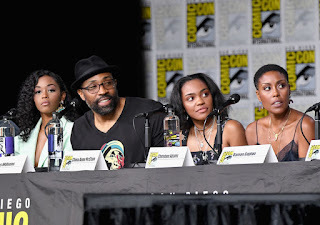 So getting the chance to talk to the cast for a second time at Comic-Con was a delight. 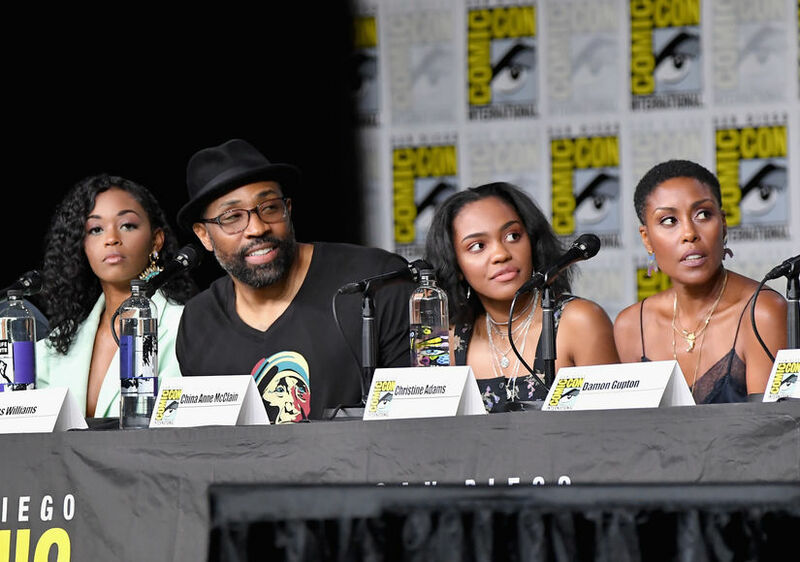 The cast and creators are so thoughtful and articulate not only in how they describe their vision for the show, but incredibly poignant in how they portray this black family and our community. So what did they tease about season two? Well: new tech, new suits, and probably new cell phones for Team Lightning to start. Hopefully we will also get an answer to a current work/love life imbalance for Thunder and Lightning, as well as fresh eyes for a particular law enforcement official and best friend... who will still be in the dark about his friend’s superhero alias. Finally, we can look forward to more stories that expand the Lightningverse — with hopes that eventually characters like Static Shock will enter into the fold. Until then, let’s count the days until we get what is sure to be a dynamic second season. From the moment that the lights went down and the multi-screens were revealed, I knew this presentation would be a highlight for me. With trailer reveals for Fantastic Beasts: The Crimes of Grindelwald, Godzilla: King of the Monsters, SHAZAM!, and of course Aquaman, this presentation did not disappoint. The way that the studio flowed from film to film, showing highlights and exclusives, was truly fantastic. While there was some footage left just for Hall H eyes, I can say that if the Aquaman trailer didn’t pique your interest, stay the course because the extended trailer has me even more excited for December 21! Godzilla: King of the Monsters will just be a largely insane good time, and it is good to see O’Shea Jackson Jr. in another role after his stellar performance as his father in Straight Outta Compton. SHAZAM! is really just Zachary Levi portraying himself in a superhero suit, while The LEGO Movie 2 is going to be adorable and hilarious. Be sure to watch out for Tiffany Haddish as... what else? A unicorn, of course! Wonder Woman 1984 (#WW84) will be a stand alone film, that — per Patty Jenkins and Gal Gadot — shouldn’t be judged as a sequel, but rather another chapter in Diana’s story. So how on earth is Steve Trevor back? We will have to wait until next Comic-Con for more robust footage. Until then, the exclusive nugget they shot was adorable and had me ready for November 1, 2019. Finally, the Fantastic Beasts trailer and presentation took us on a wild ride, with the most fan interaction of the presentation. But will this sequel exceed Potterheads’ expectations? Only time will tell. I can say with certainty though that Warner Bros. brought out all of the stops this year and have me wildly excited for this next slate of films! All in all, Comic-Con 2018 was a success! I cannot wait to head back next year to see old favorites and get the new scoop on my favorite fandoms — and all things pop culture. Until 2019!